I hope you had a nice week, and I hope the next one will be even better. 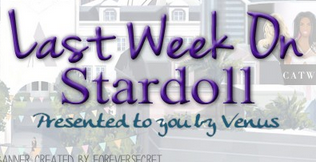 On Stardoll, there are some things to look forward to, but let's be patient and just remind ourselves of important events and releases that we got last week. It started with new Young Hollywood collection. This time, surprisingly, we got a full collection, not just few items. The dresses were mostly gorgeous, but slightly overpriced. Black, white and red are dominant colors, and there is one blue dress. Aside from dresses, we got some other outfits, like Solange outfit, (I really loved the top and I am so sad I missed it. ), and Rita Ora JPG outfit. Accessories are really great, basic but still great for making outfits. Anyway, pretty good collection, agree? On Wednesday, Stardoll released new floor at Minimalism interior store. The collection gives the impression of 'rich' suite, and the background, just wow. Every piece has that 'luxury' feel, with carefully picked and designed items. There are some interesting additions, like that stack of magazines, and a 'shoe dictionary'. Really great collection overall. And that time of a year has finally arrived - the beginning of this year's Miss Stardoll World contest. Okay, so I am not going to talk about basic stuff you all already know. I am here to discuss the changes Stardoll made for this year's contest. First of all, we are not bound by country, and instead of top 20 voted countries going to finals, now it is open for everybody, and anyone who meets the requirements can run. The downside may be that too many users from one country get chosen while other, less known countries, get 1 or no semi-finalist. The 2nd is, no real life prize. We always had a real life prize for winner, like iPhone, Mawi purse, a tiara, Digital Camera, and so. Only exclusive, one of a kind dresses (Stardoll dresses) for top 3 members. And finally, no dresses in MSW promo freebies. On Friday, we got MSW inspired store, as usual. The store is gorgeous, as usual. We have a lot of elegant dresses, some couture items, and some unusual items. I am not a huge fan of a collection, but there are certainly some items that caught my attention and plan on buying.. well someday. Like that black sparkly dress, or long silver gown. Pretty appropriate collection for such an event. Now I am going to mention few things that happened but I decided not to recap. First of all, along with MSW starting, we got an offer for buying stardollars we'd get 10% extra. )Which is expiring by the end of the day. Broadcast price has risen again. of course. Also, Museum Mile SNTA collection is leaving the plaza, and the winners got announced before, which means new collection is just around the corner. (I think we can expect it, if not this Monday, next week definitely.) And the best one, we are finally getting updates to our wardrobes. Stardoll sent us a mail explaining all changes we can expect, but when I clicked on mail, it said no such post exists. Maybe they sent it too prematurely, I guess it takes a lot of time to perfect the update, but I am really looking forward to it, probably along with lots of other members. And that's it. Wishing us even better next week, so have fun, vote, comment, and see you next week.